At least for today! Sorry I dropped the ball my friends. I let myself get distracted with errands and other real life events. So obviously, I did not get to The Friday Update. I assume you all survived just fine without it. But just in case…here it is now! And it’s a good thing I waited because so much happened, not just last week, but over the weekend as well! 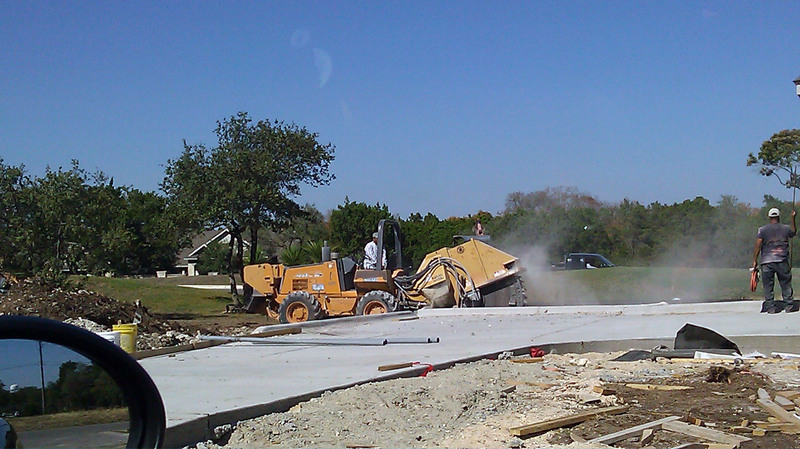 If they keep up the pace they should be completely done with the front today, and started on the back. Both sides are complete. I love the brick, but I have to admit that it is not anywhere near the color we thought we picked. The sample of this brick was very grey. The actual brick turned out to be more brown. But it is still nice. Then in exactly two days they did this. 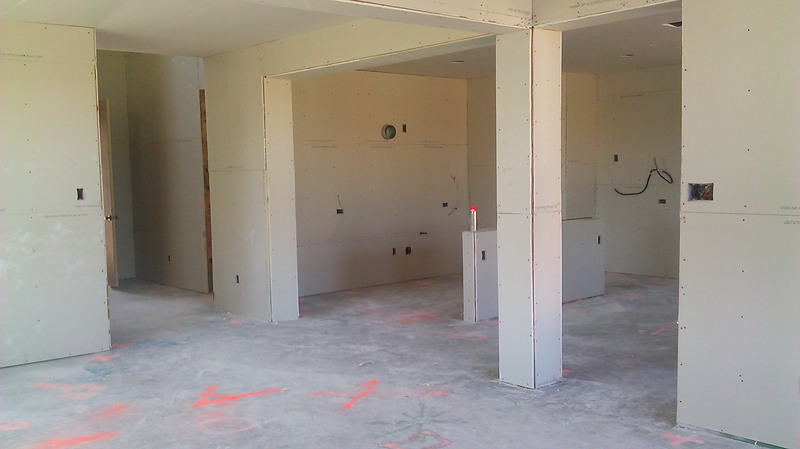 That’s right folks, we’ve got drywall. 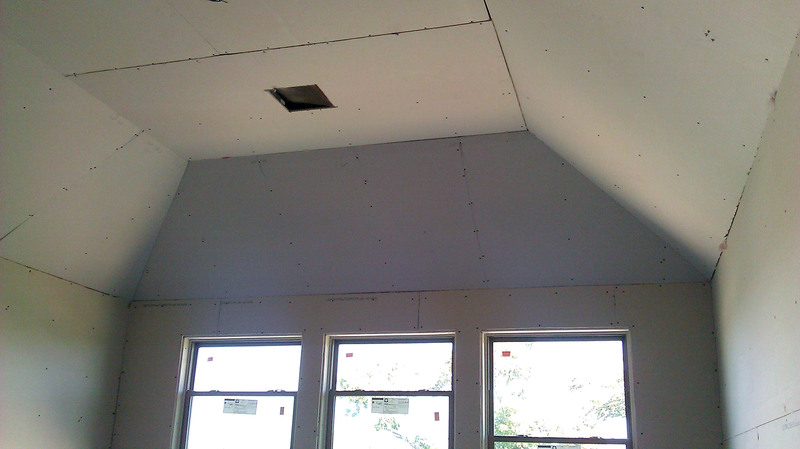 From floor to ceiling, the dry wall was complete in two days. I am not even sure it took the two full days. They started later on Friday and then were cleaning up around 2pm on Saturday. 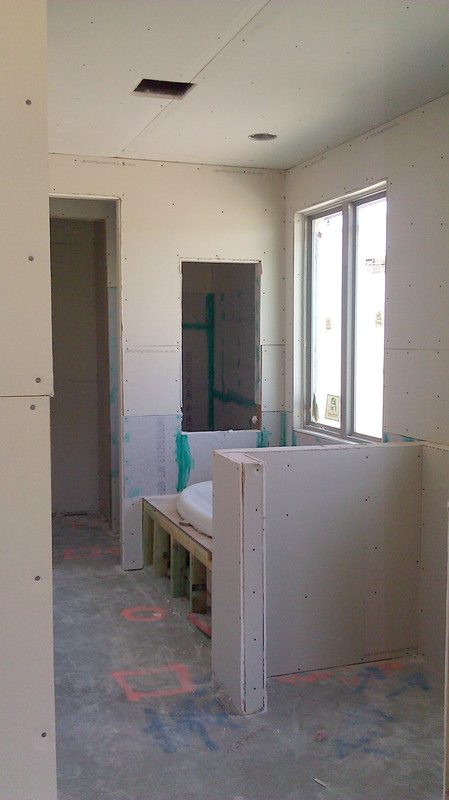 Pretty amazing, especially if you are a person that has ever worked with drywall before. When you don’t have a crew of really strong guys and all the right tools, let just say it takes longer. MUCH longer. So that is where we are at so far. 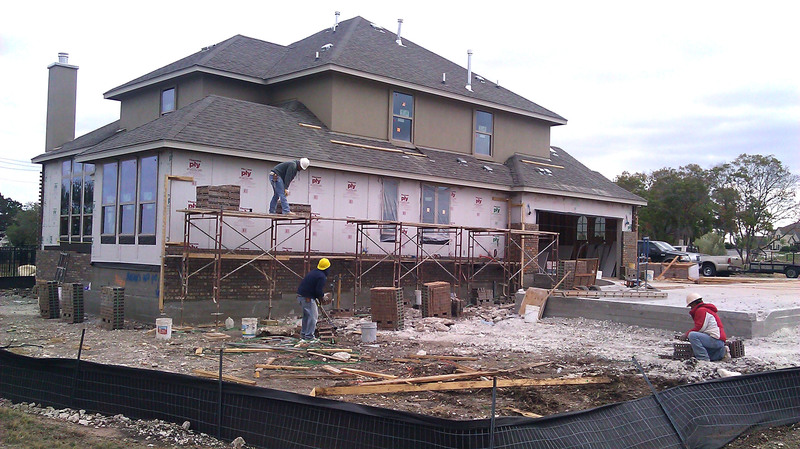 Pretty exciting to see all the walls up and the house taking shape. 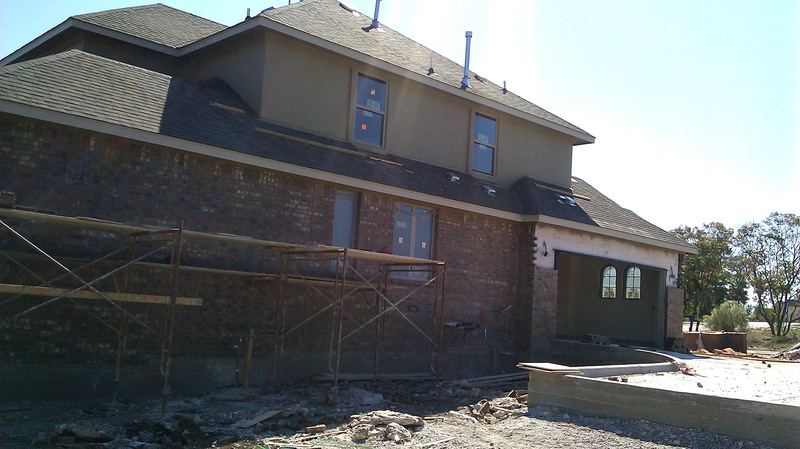 I can’t wait to see the brick finished and the front walk put in. 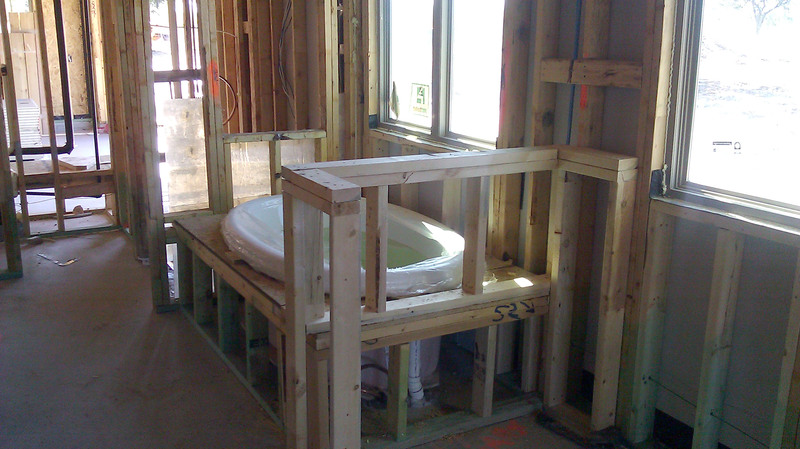 However, the thing I am most excited for is the day they remove that gross outhouse from the front yard. YUCK! Seriously that thing is so annoying. Dan and I are super excited for all the projects we have planned when the house is complete and we can’t wait to share them! Hope you had a great weekend! So today is Wednesday and that means that I usually try to come up with a little boost or thought. Something to help us get through the week. However…today, I have nothing. That’s not to say life isn’t inspiring. It is! It is a beautiful day. My life is on track for happiness. My kids are making good choices and all seems to be well with the world (my personal world, the rest of the world, not so much.) But as amazing as it may seem, I have nothing to say about any one topic. My mind is blank and open for something new. So I am turning it back on you. Surprise! I want to know what you are thinking about and what inspires you? We all experience things and make observations each day. A lot of times we learn something from those observations but it seems too small to share. 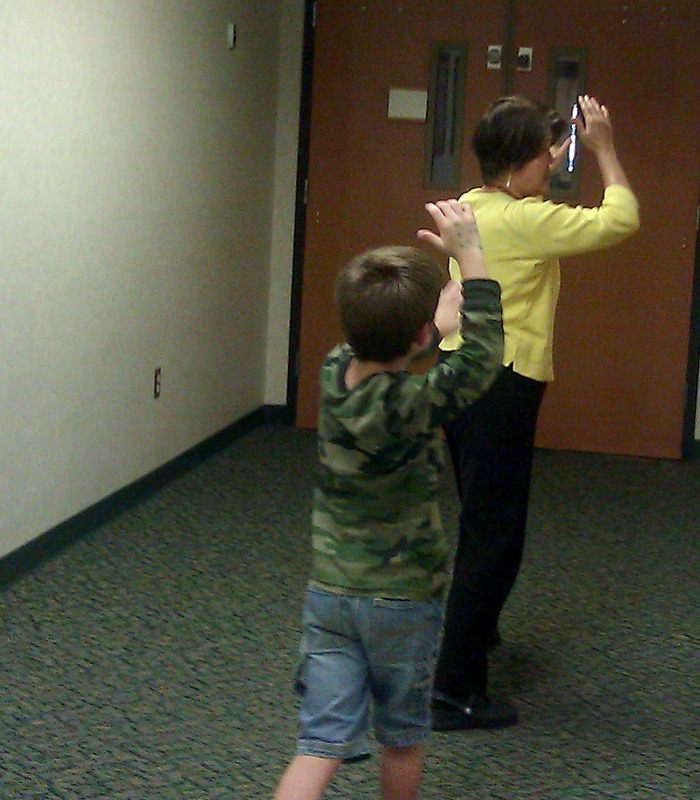 For example, yesterday at the library there was a lady doing some Tai Chi. Well my boys were fascinated. Just as any Avatar (the cartoon, not the movie) fan would be. 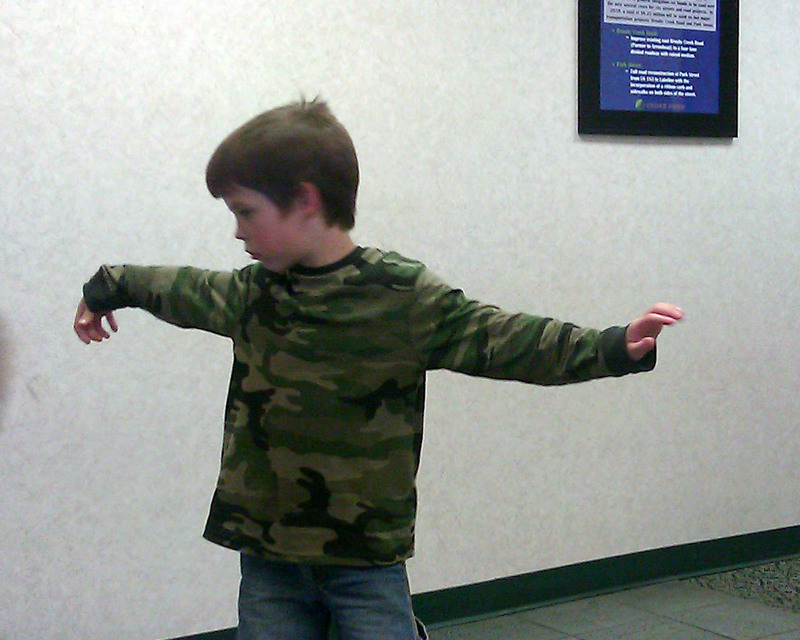 I told him that Waterbending is actually Tai chi and that he should go ask her if that is what she was doing. Not only did she say yes, but she came out and guided Austin through a whole sequence of Tai Chi movements. It was so beautiful. I wish I had captured it better on camera. What an amazing lady. She took a regular day at the library doing homework, and made it a truly magical experience. I realized how simple acts can create such beautiful moments in time. A small lesson, but a very important one. Each day we encounter moments like that. Maybe some of them are so small, they don’t become a topic in our journal. Or a post on a blog, but the lesson means something to us. Sometimes small things impact us in a large way. What small thing have you learned or observed? The Smithocracy celebrated a weekend of Dance! Well hello! Hope everyone enjoyed their weekend. If you recall, I snuck in a little last minute post on my personal love for Dance. A little extra Friday post, if you will. Well not even 30 minutes after I posted that blog article I received a phone call from one of my wonderful friends. Her husband, my hero forever now, got 4 tickets to this little performance. and wanted to know if Dan and I would like to join them. So of course I said YES!!!! It was really fun! I loved watching all the dancers from season 8, but my favorite was, of course, this guy. Where we saw him do this. Or something very close to it. I didn’t get any video or photos from the event. (I am shamlessy borrowing) But the guy jumped on one arm for like a full minute. It was insane. Another huge favorite was this guy. So that began our weekend of Dance. On Saturday I got to surprise the Junior Smithocratics with a little something I had been working on in secret. I had been practicing for three weeks and Saturday was finally the day. We did it at the Domain for Dogtober fest. It was a blast. My Zumba instructor for the gym organized it. You can see me come in on the far right at :44. Another friend joined me on this and it was such great fun, I may do it again. Shhhhhh. Later that night Austin challenged me to a dance battle, so we slammed on some tunes and threw it down old school. After much debate I was declared the winner for my mean robot style. Later, during a re-challenge, Austin and I tied, since he hit me back with some freestyle crazy legs. So all in all a super fun weekend of Dance. What about you? Does your family have any secret passions? P.S. Oh no! Did you forget to like me? That’s ok, I still like you. But lets make it official! Head on over to The Smithocracy Facebook Page and like me for reals! You will be kept up to date on all things Smithocratic. I just want to dance!!!!! Well I guess I wasn’t quite ready to say goodbye yet. While I was waiting for my video to upload I came across this amazing dance video. And anyone that knows me knows that I absolutely cannot dance. But I do LOVE it. In fact this is mine and Austins greatest obsession. And when I say dancing I mean…the Robot. Mechanical Movement, whatever you want to call it. Yes we are dorks. So I had to share the video, and then I figured I might as well share all the videos that Austin and I obsess over. Our favorite dancer being Madd Chadd. Oh yeah. One day we will take this knowledge and apply it in a way that will blow your mind. Watch out. I can robot like nobodies business. But I will challenge anyone in a game of Dance Central. MIchelle!! 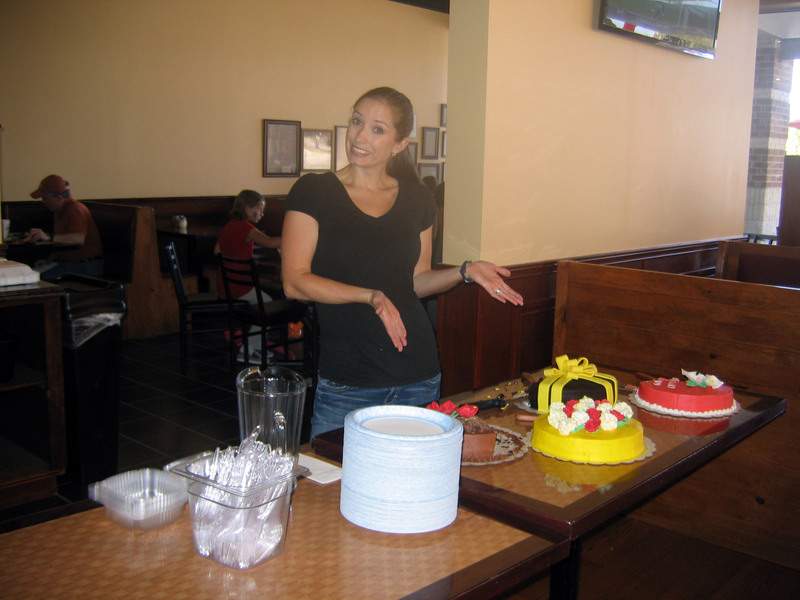 Congratulation Michelle! I will contact you shortly and let you know how to get your free two-topping large pizza. For those who wonder how I picked the winner, well I went to random.org and used their random number generator. So it is all nice and fair. Thank you so much to everyone that entered! I loved reading all your comments. And The Pizza Man really enjoyed them as well. Hopefully we will have more giveaways coming up in the future. I will keep you posted. It is Friday and you know what that means. Friday Update Time! Well last week I did not have much to report and no pictures. How boring for you! Well I am about to fix ALL of that. So much has happened, it is so exciting. So lets get started shall we? 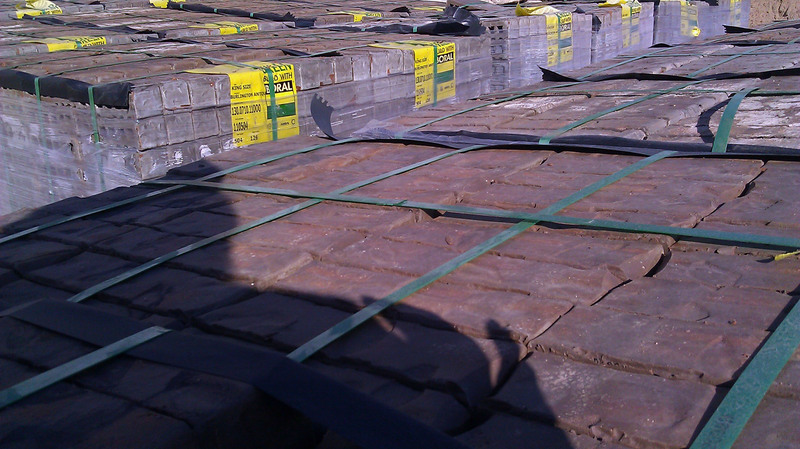 The Very Most Exciting Thing is they delivered our brick! Piles and piles of it. I was so happy to see it in real life. What a relief to know that I still liked it. 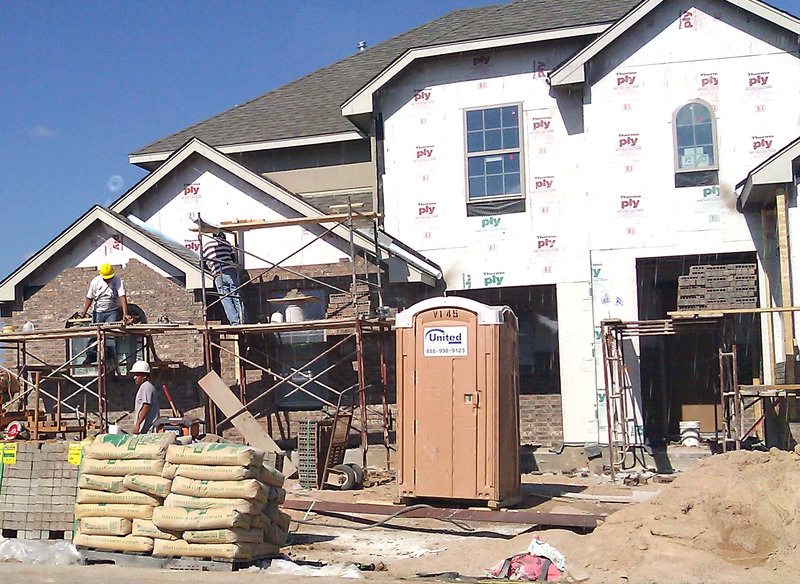 :-) In fact as I am typing this, the masons are working this very minute placing the brick ON the house. I have not seen it yet, so you can’t either. 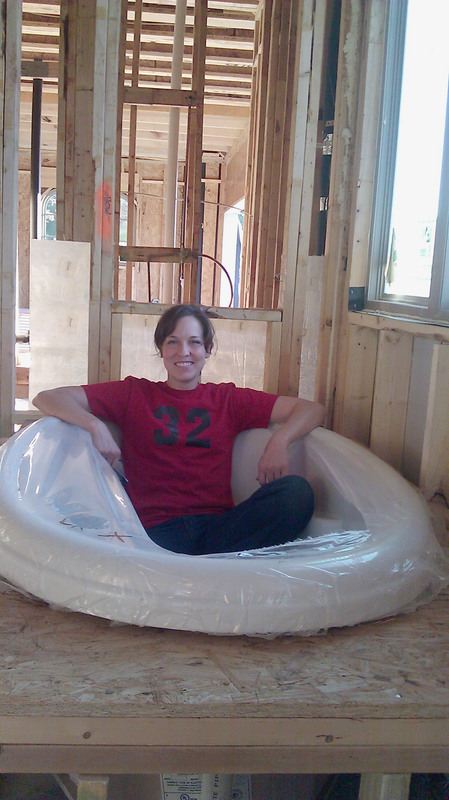 No more Future Tub, Real Tub is here! 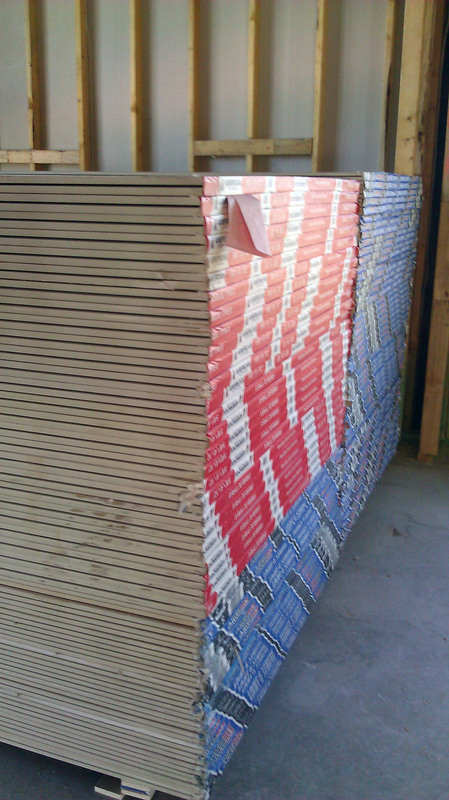 They also delivered this… Sheets and sheets of drywall! 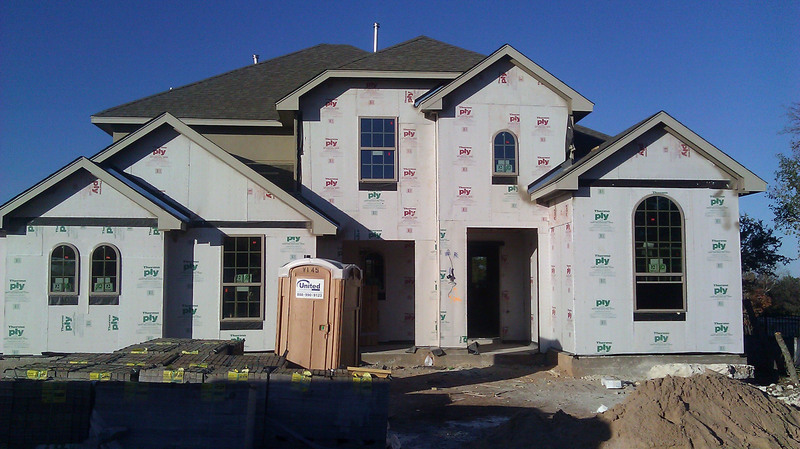 So not only are they doing the brick work right now, they are also installing the insulation, which you know what comes after that…yep, drywall. So next week is going to rock. I feel very giddy about it. 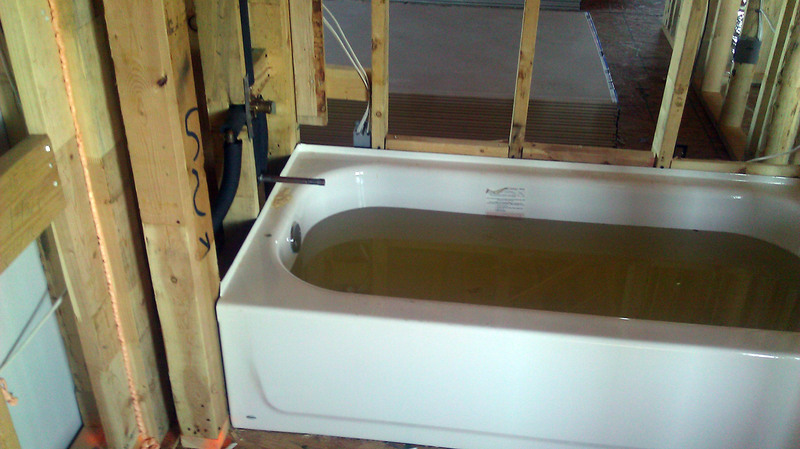 The tubs also got to hold this lovely water. I am sure it is useful for something, but mostly it makes me think “yuck” and of mosquitoes. 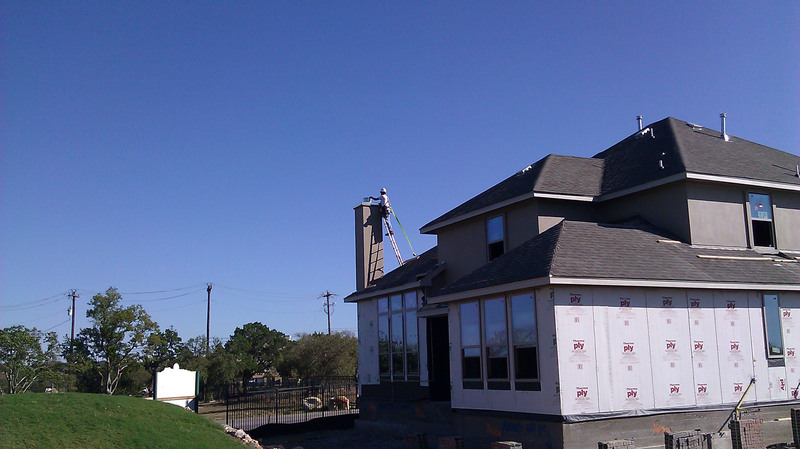 This guy showed up one day and finished the fireplace. It was super windy too. I was nervous for him. The very favorite moment of the week was for my boys, when this guy showed up. 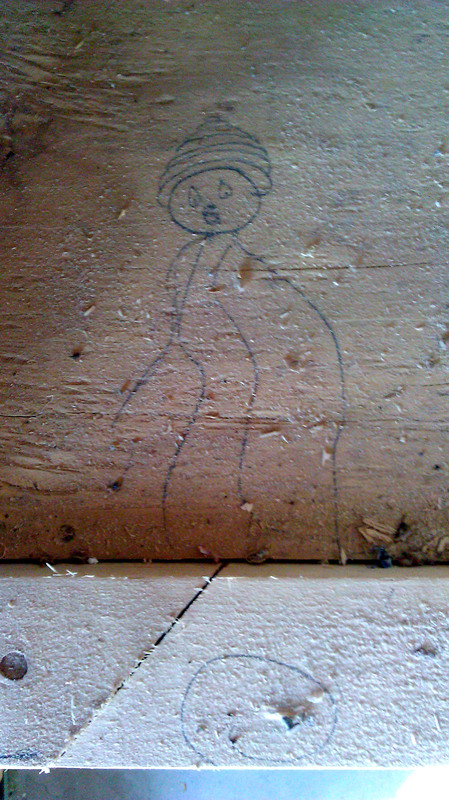 We keep finding funny little faces and drawings all over our house. So if you feel the need to contribute, go right ahead. 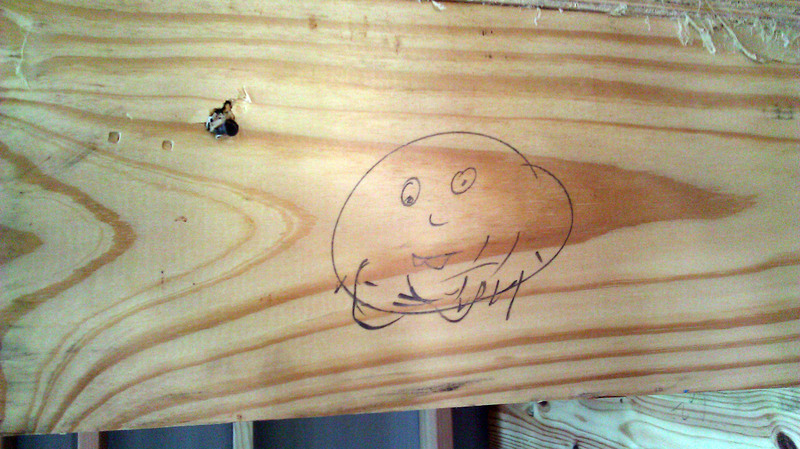 But once the dry wall and paint is up I will glare at you…a lot. Right now it is cute. The kids love searching for them. So what a fun week, and don’t worry, I did not forget my promise of a video tour. I just wanted to make you wait all the way to end. hehe I am evil. Please ignore the chewing sound. I am SO SORRY, I totally forgot I was chewing gum. :-( I feel so ashamed. Enjoy and have an Amazing Weekend! Change…and not the loose kind. Well this little Wednesday boost is coming a little late on Wednesday, but it is still Wednesday! Also I am not so sure it is so much of a boost, as a pondering. Today I want to talk about something that has been on my mind lately. And that is Change. Frequently at the Gym I hear the term “Pain is Change.” And we all know that is true. In fact a good friend of mine wrote an excellent blog post on that very subject that is well worth a read. You can read it here. I believe that pain and change are symbiotic. You can’t have one without the other. Which is good. The pain gives us the motivation to make the change that is necessary. It is a tool to make us uncomfortable enough to want to change, and hopefully make it permanent. Usually it comes about by some sort of catalyst. We have something happen that causes us to want to change. For example when I was first married, I was very happy. I was so happy I ate all the food I could see. I noticed that I began to gain weight. A lot. However I didn’t feel like doing anything about it. It wasn’t a big deal. I could fix it later. All the excuses we tell ourselves. After living in denial and laziness for a while, Dan and I went to a reunion of sorts. At the reunion we took a photo with a bunch of former school and church mates. I think you can see where this is going. When I saw the photo, I saw that everybody looked the same, everybody except me. This event bothered me. It was shocking to see such a stark comparison. It bothered me enough that I realized I could do something about it. It took a while, but I finally made the changes I needed to lose the weight. I have tried to maintain a healthy lifestyle since then. That is a pretty minor example. There are, of course, major catalysts that occur. The addict that loses everything and turns their life around. The gossiper who becomes the subject, and learns the hard way the damage that does. I recently learned about someone who was an alcoholic. One night he was leaving a party and couldn’t find his car. He searched and searched. The end result was he reported it as stolen to the police. A few days later his friend called and asked when he was going to get his car. It was parked right in front of the house. This was a wake up call and he has been sober ever since. So events occur that cause a change. Like I said, a catalyst. But why do we need the catalyst? Often we are already aware of the problem. I was totally aware of the fact that I needed to lose weight. I am sure the former alcoholic was aware of his problem on some level. We all have something in us that we know needs to change. So why do we wait until the pain of change can be at its highest? In Change Anything, a book by Kerry Patterson, Joseph Grenny, David Maxfield, Ron McMillan and Al Switzler, it states the following about changes. Wanting to make a change does not seem to be enough. A general desire to change will result in weak resolutions and unsuccessful results. I know this first hand as I generally have the desire to write in my journal consistently. However that has yet turned into a real action. Although I guess I can start counting this blog. But you get the point right? So my wondering is, why do we wait for that pain or catalyst to motivate us to change? What stops us from doing it sooner? If some major disaster happens and I discovered that if I had only kept up on my journal writing, it could have been avoided. You bet your bottom dollar I’d be writing in my journal like a mad man after that. I guess that is where self-discipline comes in, and maybe that is a part of pain too. Perhaps if we are willing to make a change, one that was not caused by something, then we have to be willing to force change and accept pain into our lives. To purposely go about making ourselves uncomfortable. And then when it does become uncomfortable, we must make the choice to quit or keep moving. Thereby, going forward with the pain, until we have achieved the new change we set out for ourselves. So, pain is a good thing. We can either wait until it peaks and forces us to act, or we can take control and welcome the pain a little sooner. Either way the choice is ours! Which just links back to my original Wednesday boost on choice! What are your thoughts on this? Do you agree, disagree? Like I said, I have just been pondering it lately and I’m curious what you think as well. P.S. Don’t forget to register for the CraigOs giveaway!!!!!! The winner will be announced on Friday! As I mentioned Friday, we were to help my brother with his grand opening. And that is exactly what we did! 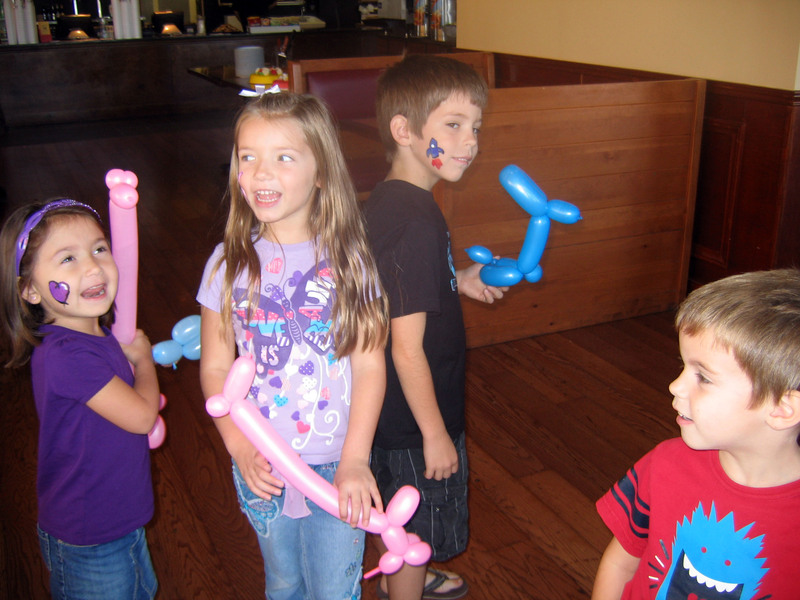 The only problem is…that I have never painted faces before and Dan has not ever made a balloon animal, let alone been an actual REAL clown. but he does have practice in just every day clowniness. Yes that is a word now. So we hit the books, google and studied up. 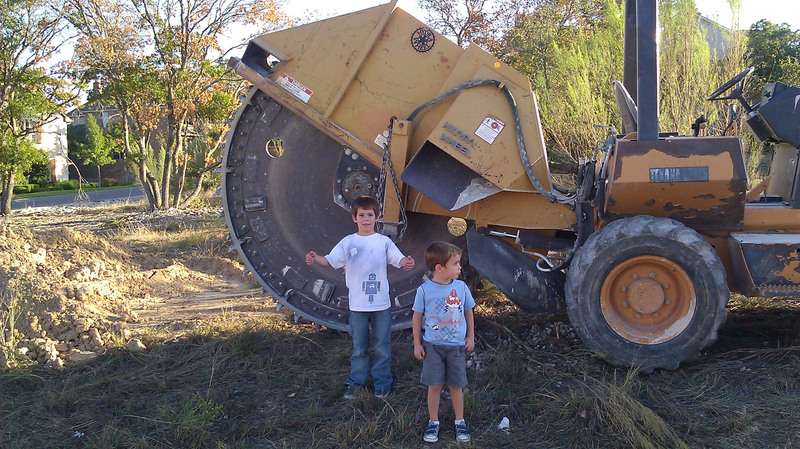 I used myself and my children as human test subjects…as any responsible parent would. Meanwhile, Dan popped one balloon after another, until something that faintly resembled wildlife of sorts began to appear. 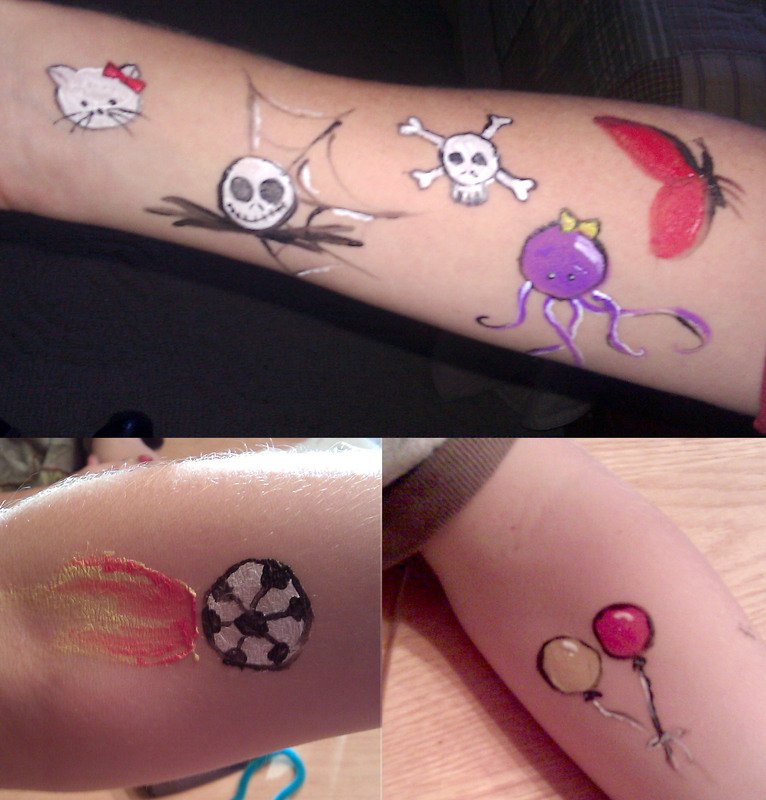 It turns out that the world of face painting is VERY serious business. Not to be taken up like an amateur like me. However I did it anyway and I think I was able to summon up some latent skill hiding from my fine art days. Wow, doesn’t that make you want to eat there? Yum yum. Stayed up till 5am making these beautiful, and may I add, delicious creations. And it was well worth it! 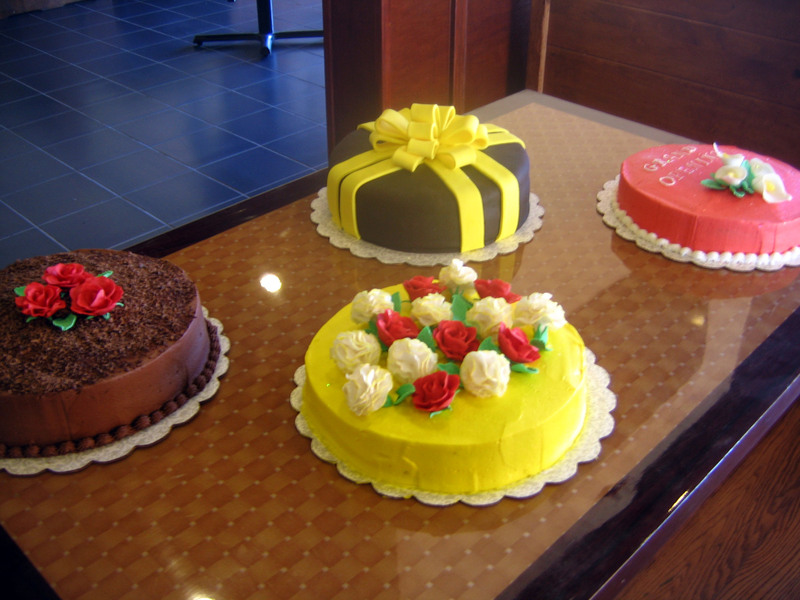 The free and beautiful cakes were a huge hit with all the customers. So much so, when my sister-in-law finally came to the store, everyone applauded. It was really cool. 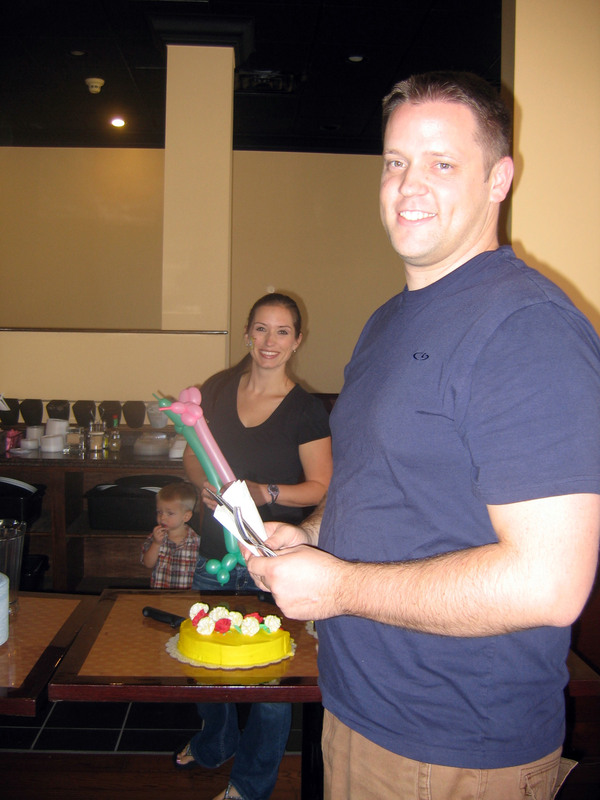 My other sister-in-law and brother helped with balloons, serving cake, and much needed general errand running. 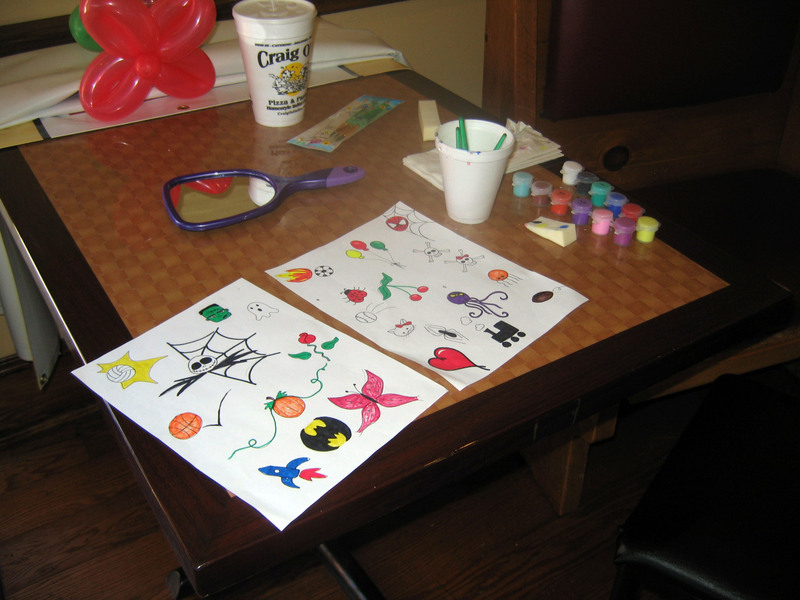 I set up my little station and painted till the cows came home…or 2:00. Whichever came first. It was 2:00 that came first, by the way. 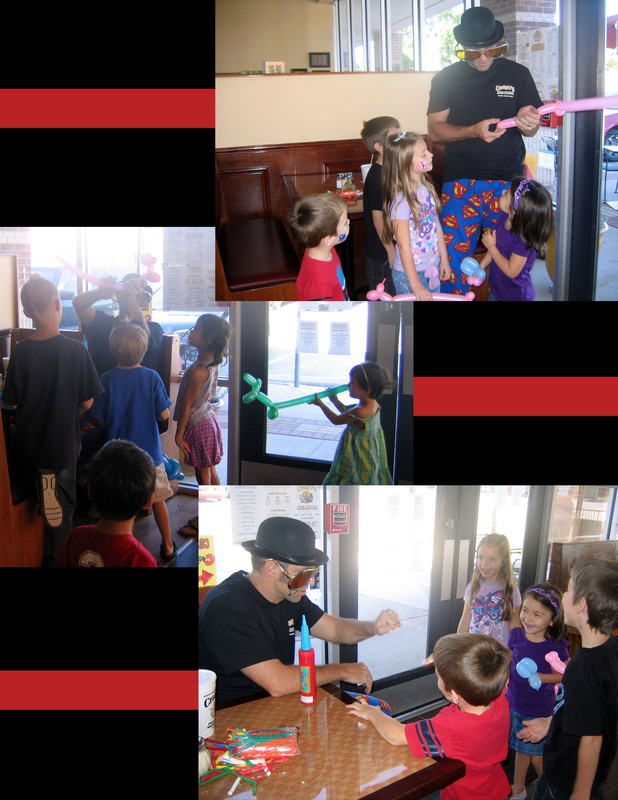 Dan clowned around making balloon…creations, for lack of a better word and doing magic tricks. Which he DOES have experience in. No studying required! The whole event was a HUGE success. So much so that The Pizza Man actually did run out of pizza dough by 8:00pm! So now you know that he makes all his food fresh and the dough from scratch. Do you need anymore incentive? How about this, The Pizza Man has approved for me to give away a free large two topping pizza! That’s right, The Smithocracy has it’s first giveaway! So how are you going to win? Well leave a comment here on the blog about one of two things. 1. If you have eaten at CraigOs tell us how you liked it, what was your favorite food and how was your experience. Grouches are automatically disqualified. 2. 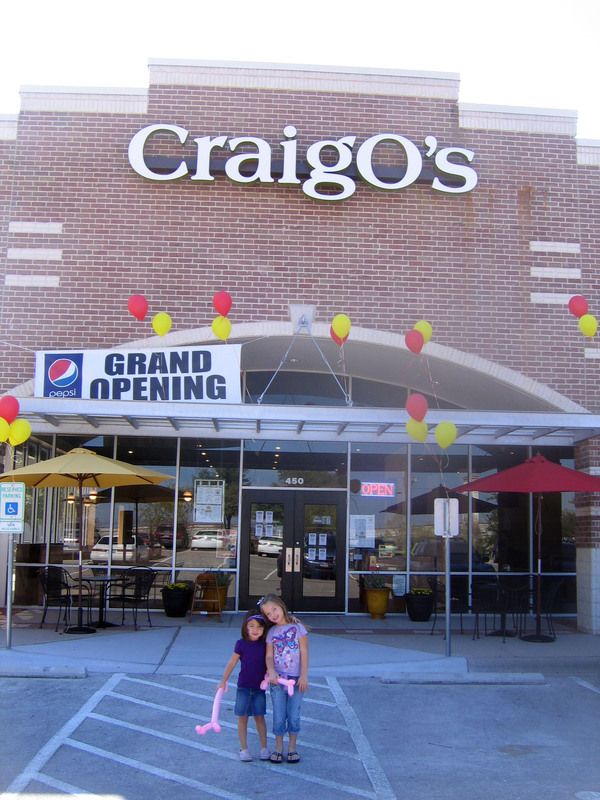 If you have never been to a CraigOs then tell us why you have the need for free pizza. From those posts a winner will be selected and this Friday I will announce the winner. Then you can head over to CraigOs in Round Rock and claim your free large two topping pizza! Never fear, they have whole wheat pizza and gluten free! Also they don’t just make delicous pizza. They have all sorts of amazing Italian food…and they deliver ALL of it. So if you are in their delivery area and don’t want to cook? No problem, give CraigOs a call and they can send you a lasagna. Or perhaps your in the mood for a calzone? Done. Is pasta the way you roll? He’s got that too. So check it out and don’t forget to enter for the free giveaway! 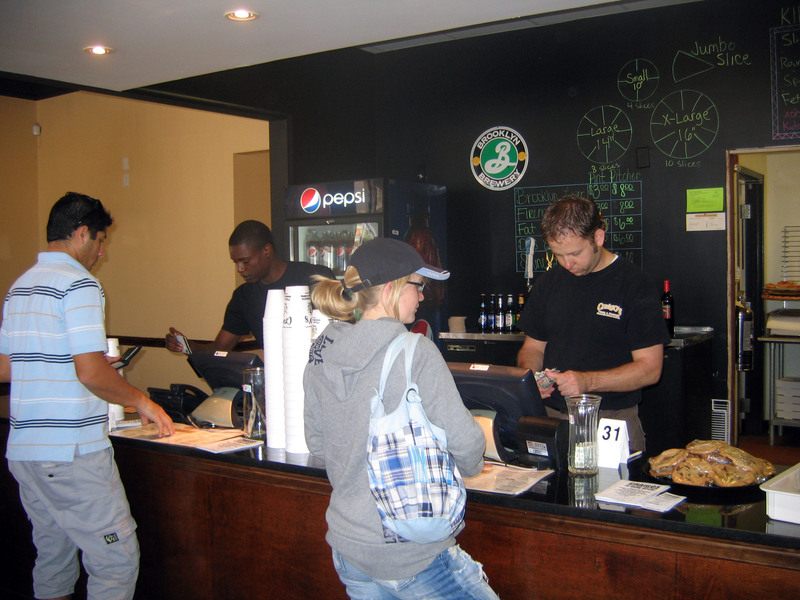 You can view a menu here, (menu may vary) and visit his store locations here and here. But the giveaway is specific to the Round Rock store. Hello! Well this week has been rather interesting. It FINALLY RAINED last weekend! Which is so great for the Austin area. 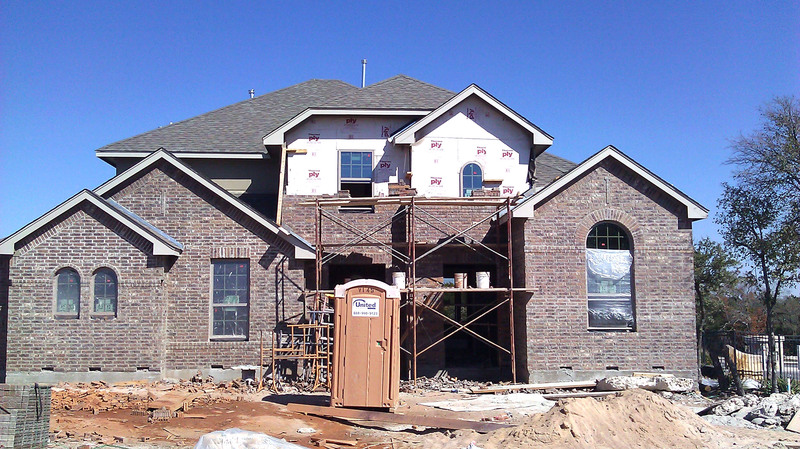 However, it is not so great for building a house. So you will notice the surprising lack of pictures in this post. Sorry about that! Not much has been done, but at the same time TONS has been done. It just all went inward and a lot of little things that really aren’t worth photographing. So here is what was done. So just a lot of little things, that would be boring to look at anyway. 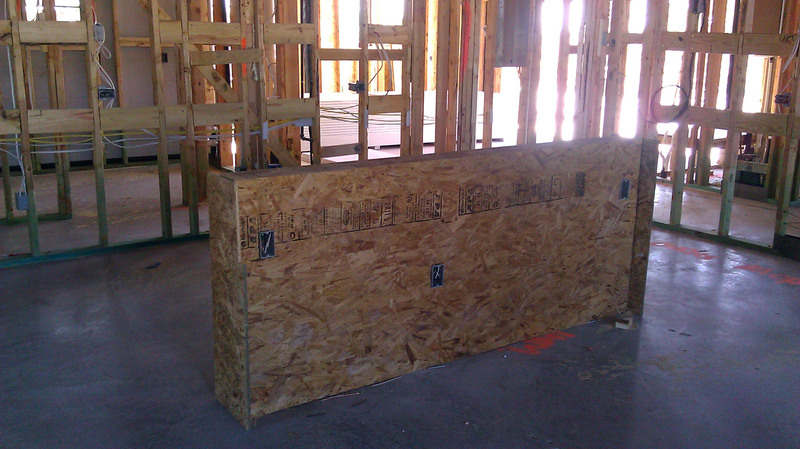 However (when I can’t take photos of course) TODAY they are putting on the stucco and some real doors showed up, they blocked out the kitchen island, and we have the pre-drywall meeting set for Monday morning. So major action is happening at The Smithocracy Domain. So be prepared my peeps! I will have plenty of photos and your very first video tour next week. I know I know, the excitement is just too much. 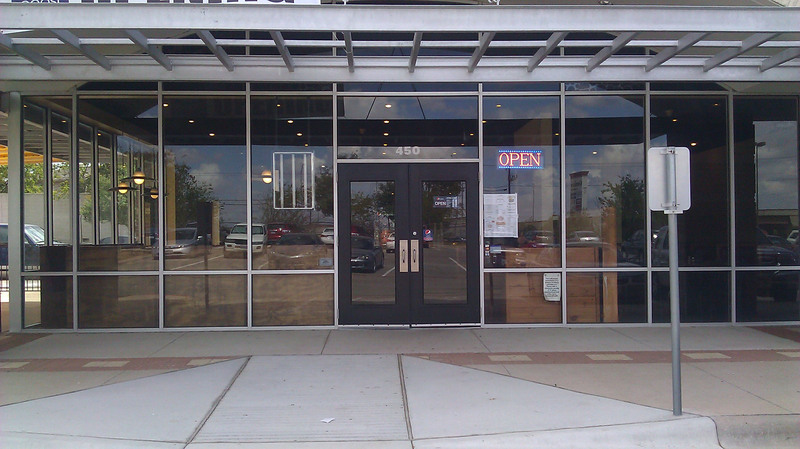 Now something else exciting going on is that my Brother just opened up his second restaurant in Round Rock. It is called CraigOs Pizza and Pastaria. His first store is on 2222 and balcones. Here is the website for that store. Designed by yours truly. The new store is located at 661 Louis henna blvd. Suite 450 and does not have a website…yet. I know that sounds like something I should say as a good sister. But I am not kidding, the food is terrific. So tomorrow he is having his grand opening celebration and pizza is 50% off all day long! Dan and I will also be there doing some kids activities from 11-2. I will be painting faces and Dan will be a clown, but not a scary one. So fun for the whole family! So if you are in the Round Rock area head on over and check it out! I will post pictures from it on Monday. It will be our little DIY because I also helped contribute in getting the store decorated. Which is still a work in progress by the way, so no judging. In fact, keep checking in on The Smithocracy, because coming up next week is a CraigOs food review where I will also be doing my first giveaway! Hooray! What about you? Do you have anything fun planned for tomorrow? Well it is nearly Wednesday again, but alas I will not be posting tomorrow. So here is a little boost, a little early. I can’t leave you hanging! Good Monday everyone. TIme for our next installment of DIY Monday. Today we are doing one of my favorite projects. 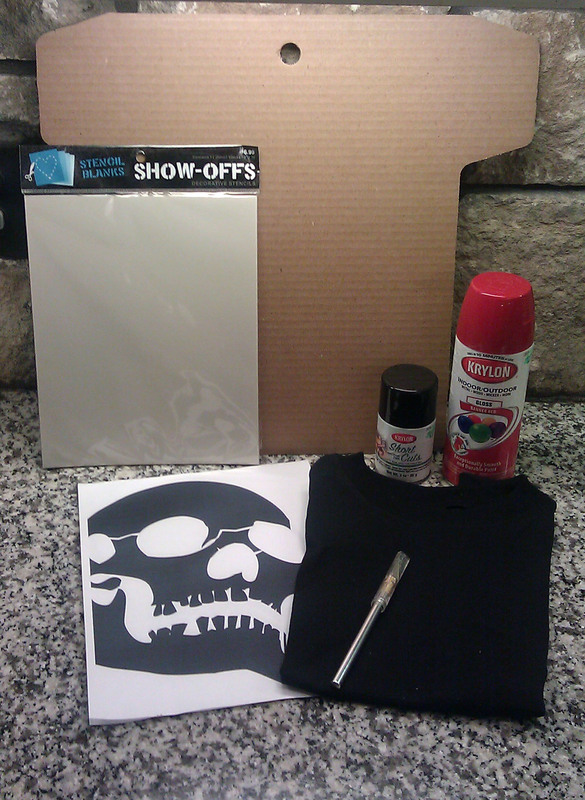 Spray painting a shirt! 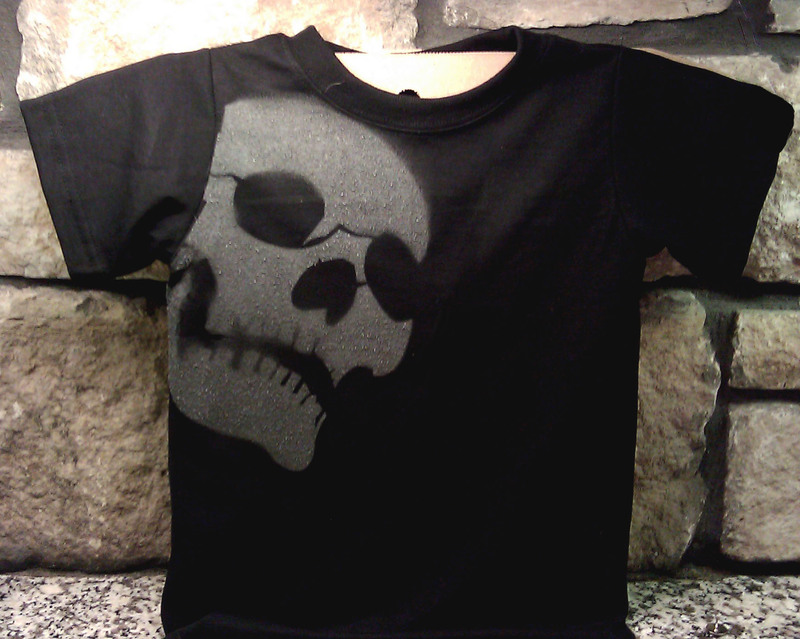 In fact, in the spirit of Halloween, we are spray painting this shirt. Sorry it is fuzzy. 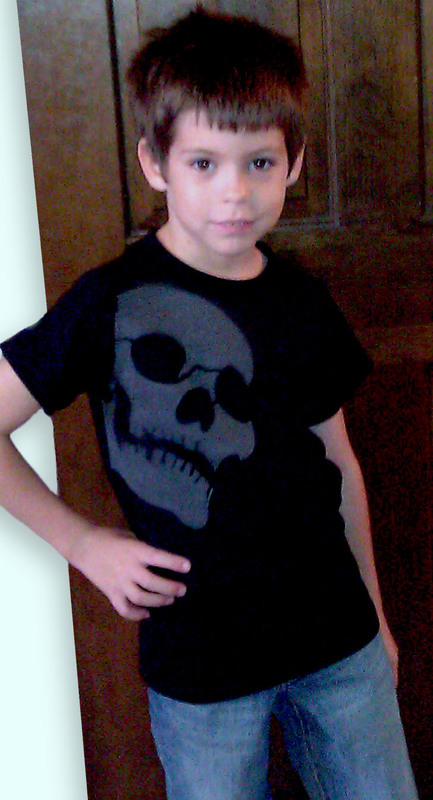 Austin loves skulls, our compromise is that if it has one skull and it’s not too gross, he can wear it. However finding a shirt with those requirements is difficult. Time to take matters into our own hands. I first spray painted shirts last year, before school started. Austin wanted a robot and a rocket shirt. I couldn’t find one that didn’t look too stupid (I have very high design standards for my kids) therefore we made them ourselves. Each time I do this, it turns out differently then expected. That is part of the fun. So how do you do it? First let me warn you, this is NOT for the faint of fingers. You WILL end up with the claw. Another thing to keep in mind with spray paint shirts is that it DOES fade with each wash. Not entirely if you use the right paint. I go into that below. I actually like it because it gives it that vintage nice worn t-shirt effect. Also keep in mind that as I do these projects, I have no idea what I am doing, so you get to learn along with me! I literally made this up last year, and am still trying to improve on it. Well, I am sure I am not the first person to spray paint a shirt, I just have not looked up or googled how to do it, so I am referring to the process, not the idea. You will need the following supplies. All of which is available at Hobby Lobby or any other craft store. I finally bought the cardboard shirt form, because I do this so often now. But any type of cardboard or poster board will work. Now you eagle eyes may have noticed that the paint I have on the photo is black and red. Well the red isn’t supposed to be on there. That is for a train shirt I am doing for Logan next. I will post that when it is complete. The black is supposed to be there. “But Tannie,” You ask, “The skull is so obviously gray.” Yes it is good reader. The reason is that I originally wanted to do a black on black shirt. I was hoping that a high gloss paint would stand out. Well it does not. So I had to make a paint switch half way through. However make sure you DO use a high gloss spray paint or the paint washes out. Austin’s rocket shirt was half gloss (the booster fire) and half matte (the rocket.) The rocket washed away and the fire stayed. Now it just looks like a weird gory blood stain on his shirt. So HIGH GLOSS paint is the key! His robot shirt is going strong a year and many washes later. First step is discovering your artwork. 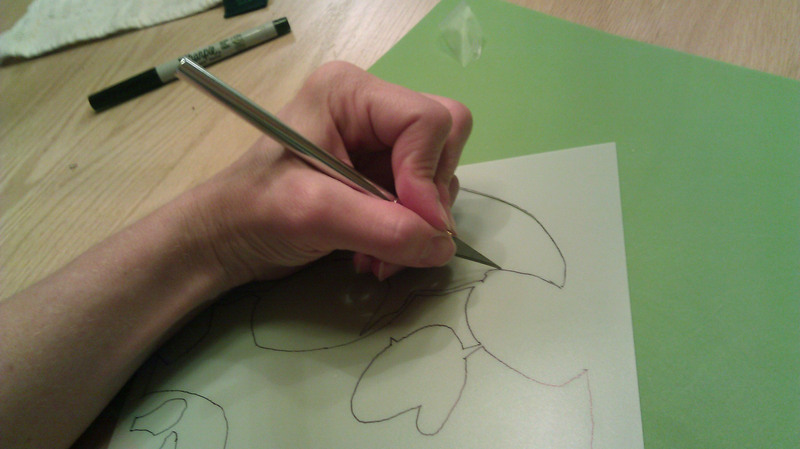 You can draw it yourself, or buy a stencil (cheating) or be inspired (copy legally) something online. I did a little of drawing and copying. 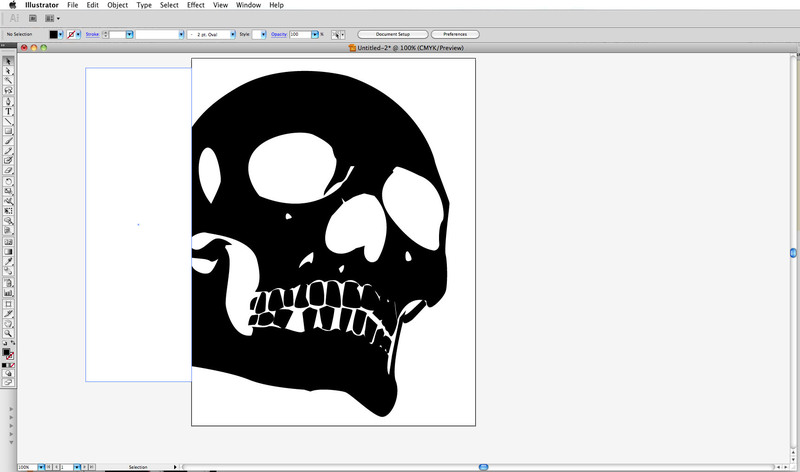 First I found some free vector skull art. It had way too much going on. 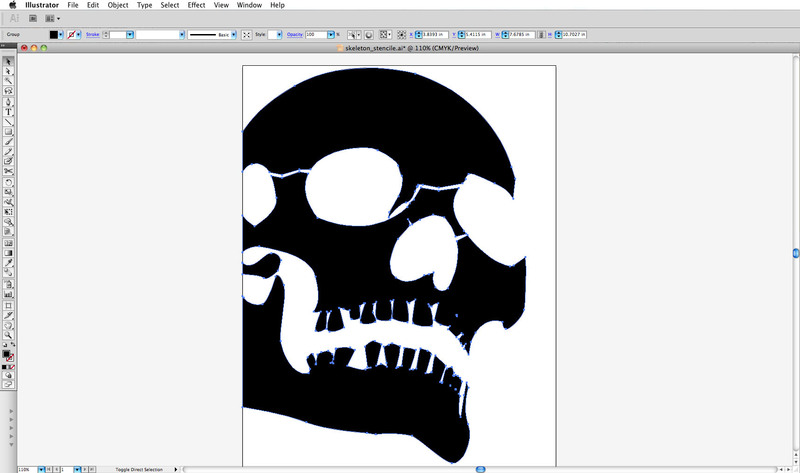 So I deleted everything but the skull I wanted to use. Then I used illustrator to flip it, move it, arrange it, until I was happy and had this. Now a really important thing to remember about creating your own stencil, is making sure it all fits together in one piece. You can’t have what are called islands. 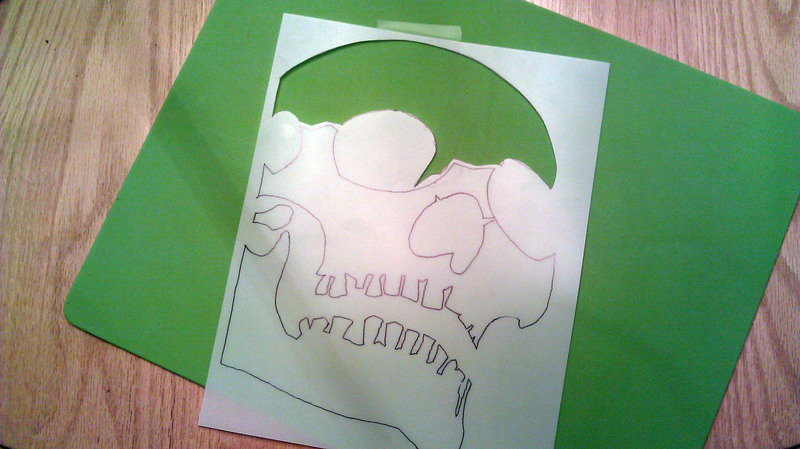 For example if I cut this out as is, the skull would not have eyes or a nose or most of his teeth. So I had to fix it some more. 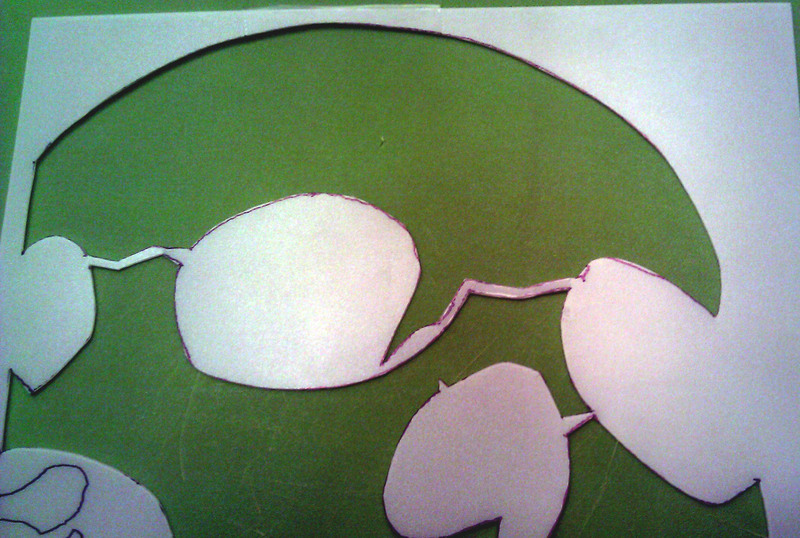 Allowing it to be one solid stencil. Here is a print out of the two showing the difference. Can you see the difference? Everything is now connected. I used “cracks” to allow for pieces to connect. 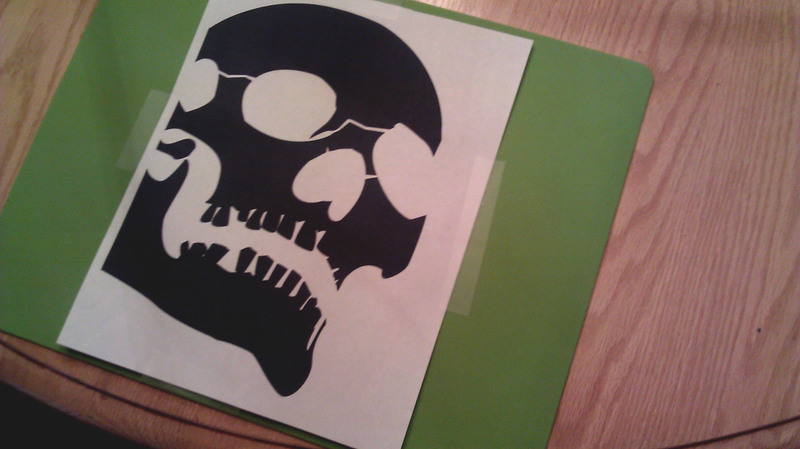 I also moved the teeth so they joined the skull, I also deleted some white spots. 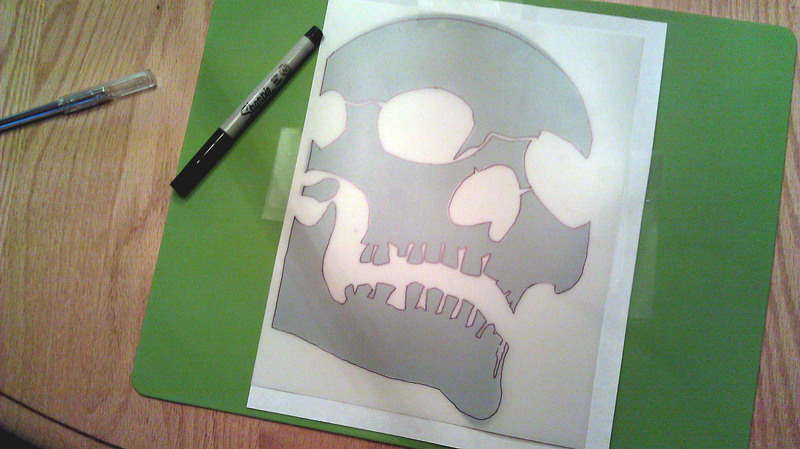 So once I was happy with the skull, I printed it out to use as a guide in making my stencil. 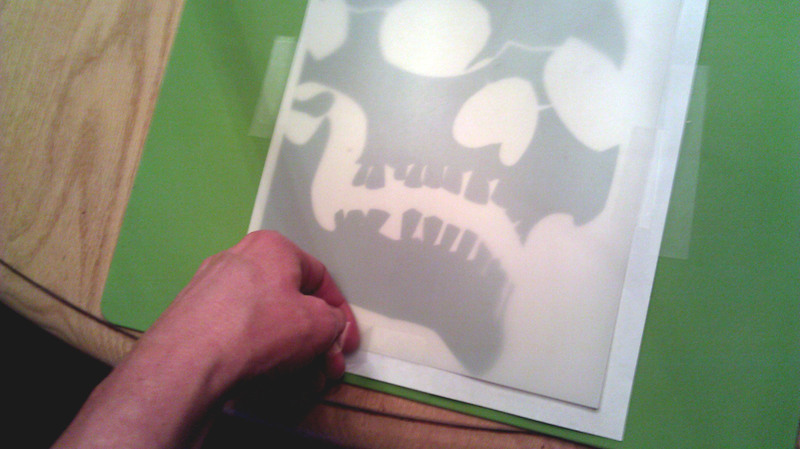 I got out a sheet of the stencil blanks, I taped the image down to the cutting board and taped the stencil blank on top of that. 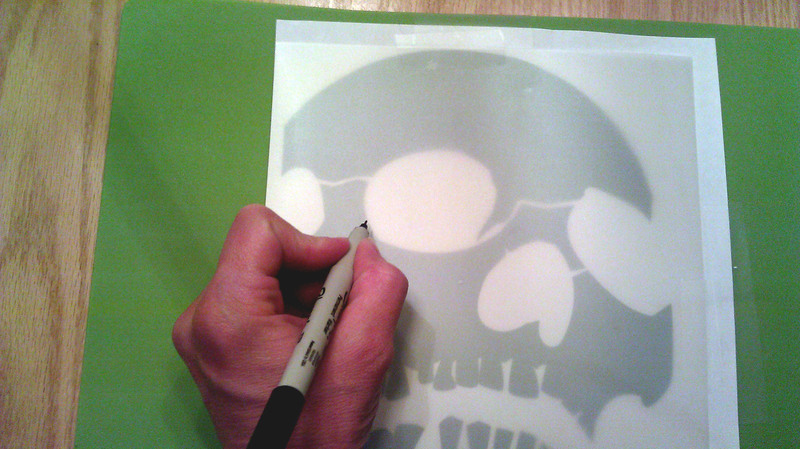 Once that was taped down I could trace it onto the stencil blank. This is a great chance to fix any mistakes or add to it. 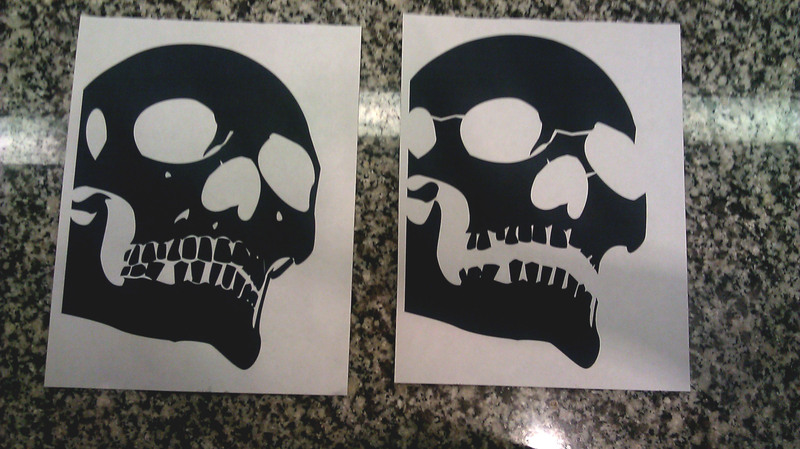 For example I made the printout too large, so as I traced I corrected that by drawing a more shallow skull and chin. I also fixed some troubled teeth. 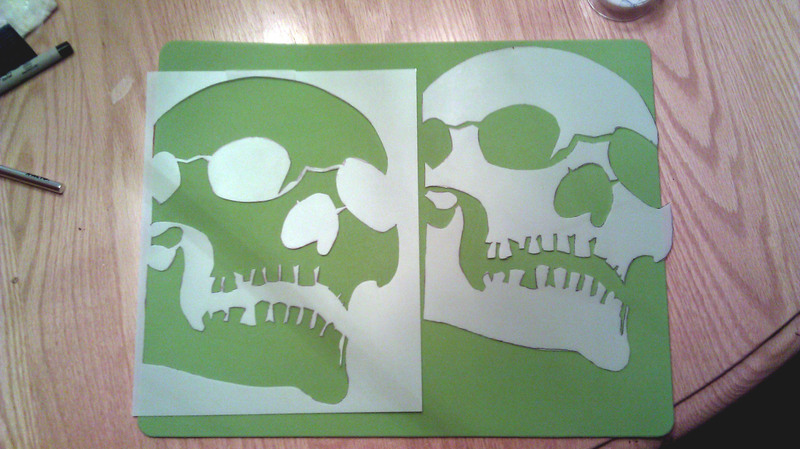 Here is the first section cut out. I always keep my negative, because they come in handy on other projects. 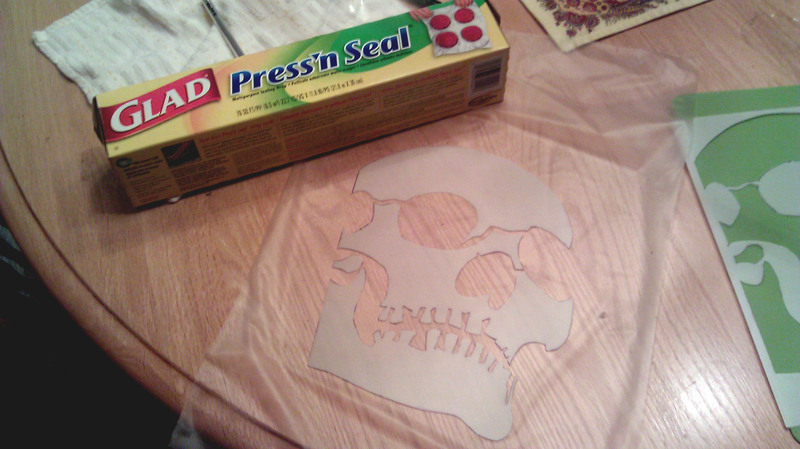 Like what if I want to spray a board and leave a skull on the natural wood. Phew good thing I kept my negative! Oh no! 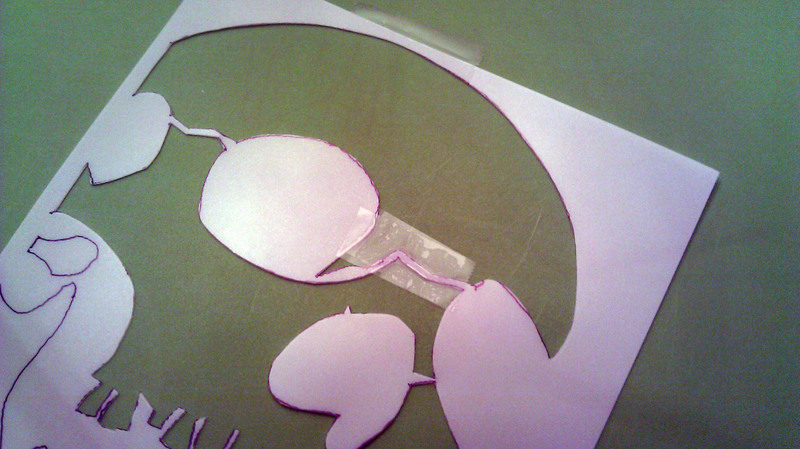 I cut something that wasn’t supposed to be cut. Never fear, now you get to learn how to fix a mistake. You take some tape and place one underneath and on on top. Making a sort of laminate type thing. See, all surrounded by tape. Then you trim it with your X-acto. See, all better! Now none will be the wiser. 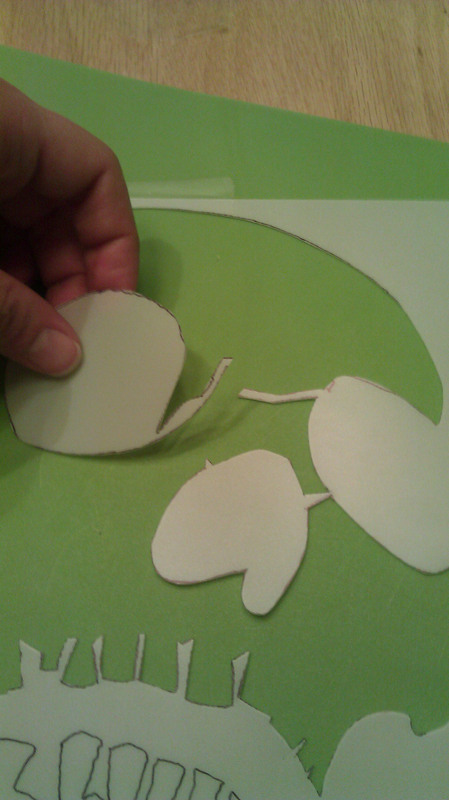 Moving on, once you are done cutting your stencil out, you should have a positive and negative stencil. We will be using the positive for this project. So lets store the negative. I use Glad Press ‘n Seal to hold the pieces in place. I wrap it up and then store it. Next we prep the shirt. This is where I fail in the picture department. Actually Dan failed. He took photos of me placing the cardboard in the shirt. But apparently not really, as I have none. So imagine me placing the cardboard in the shirt. DO NOT FORGET TO DO THIS! This prevents the paint from bleeding through to the other side. The next step is using a combo of newspaper, paper and tape, to place the stencil and block where you don’t want paint to go. Again, those pictures are missing as well. And as we practice equality in The Smithocracy, I will claim the blame for that one. 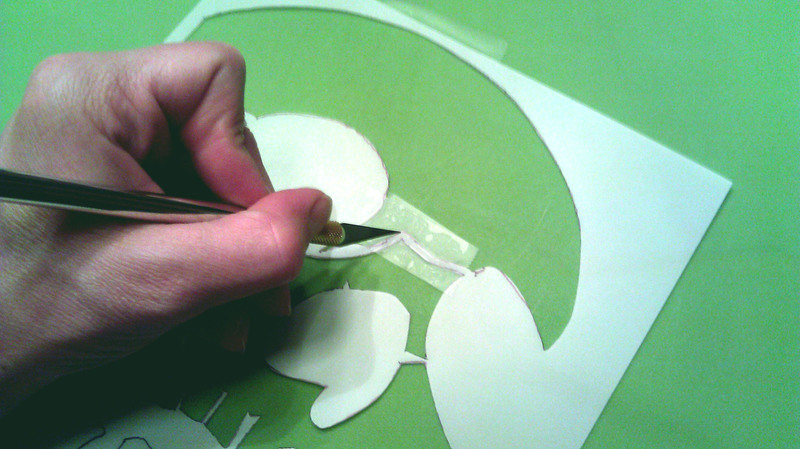 But if you look at the photo below, you can see how I taped out the curve of the sleeve. Also notice that the entire shirt is covered. Spray paint will get everywhere. So make sure you have everything taped and covered well. Next spray! Just do it as directed. Evenly and 12 inches. Here is a handy tip that I did not do this time around. I usually do this, but the stuff was in storage. 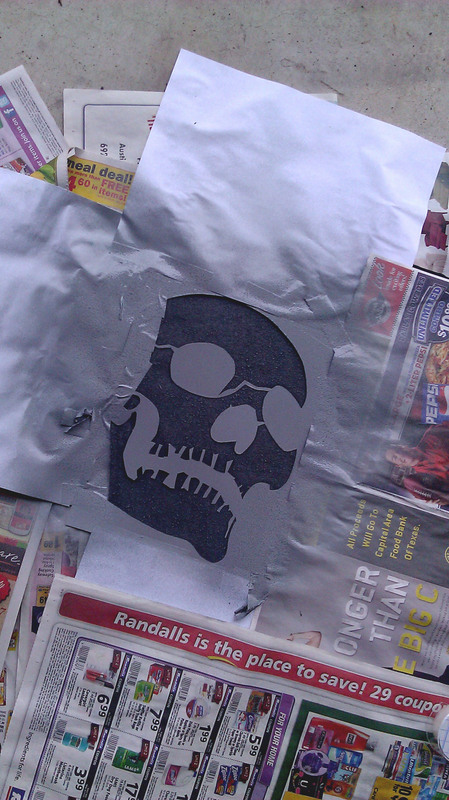 What I SHOULD have done was spray the back of the stencil with re-positioning spray adhesive. This gives you a more secure stencil that won’t shift or allow paint to cloud under. All my spray adhesive is in storage and I refuse to re-buy something I have three of. So I did the best I can, but there is some fuzzy lines. If you don’t want fuzzy lines, then get the spray adhesive. 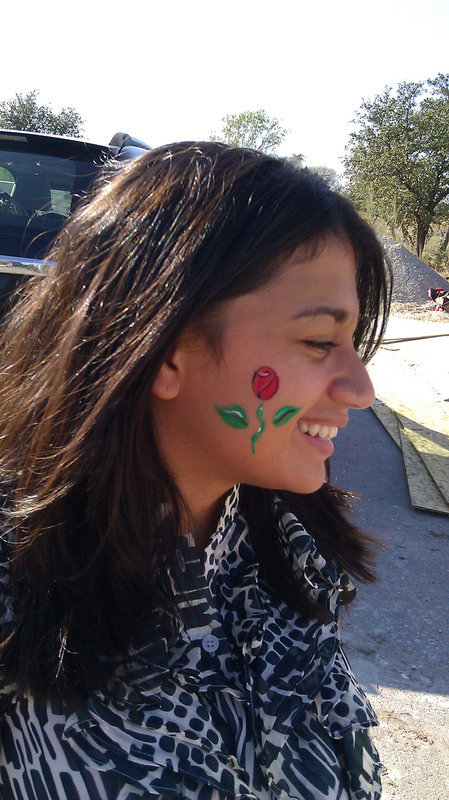 Once the paint is dry, usually about 15 minutes, you can remove the tape, paper and stencil. Prop the shirt up somewhere, with the cardboard still in, to dry completely. You can see how the teeth got a little fuzzy. That wouldn’t have happened if I wasn’t so cheap. Anyway this is a fun project that garuntees my kids have original shirt wear. It is also pretty fast. Only a couple hours. 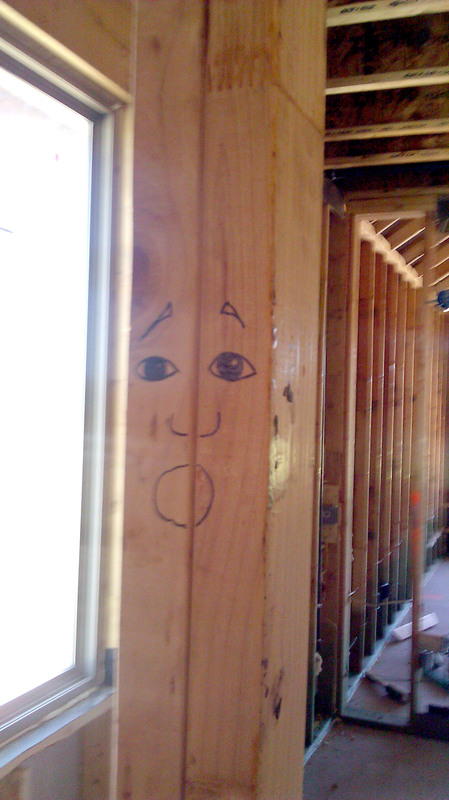 Once your stencil is dry, you can store it as well. I never wash it. I am sure someday that will be an issue. But so far it has not affected my work. This project cost me $35.94, but only because I bought in bulk this time as I am planning on making a few more. So if you are doing just one, you should spend WAY less than this. In fact the two shirts I made last year, just cost me the price of the shirt. Everything else I had on hand. You can do this to! In fact here is the skull art you need. If you do this please share it with me on our facebook page! I would love to see what you come up with!